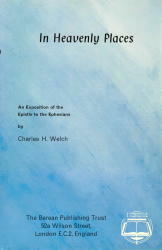 In Heavenly Places, by Charles H. Welch is an exposition of the Epistle to the Ephesians. We consider this epistle to be one of the most important books to be understood as we seek for truth for today. Brother Welch does an exceptional job of explaining the Mystery or secret purpose that was hidden in God and then revealed through Paul, our apostle.